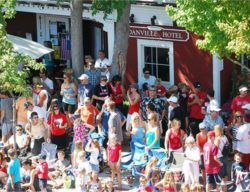 Kick off Independence Day at Danville’s Fourth of July Parade on July 4, 2018. This festive hometown event attracts over 40,000 attendees each year including local residents, family, friends, and flag-wavers from the Bay Area and beyond. Park yourself curbside and cheer on the bands, gymnasts, scouts, and other community organizations as they proudly march by. Horses and other animals will pace the route, while antique cars inch along for your enjoyment. The parade route starts at the north end of town and travels down Hartz Avenue and San Ramon Valley Boulevard for about one mile. The parade can be seen from either side of the street and there is always plenty of room for everyone. Learn more, visit Kiwanis Official Site.